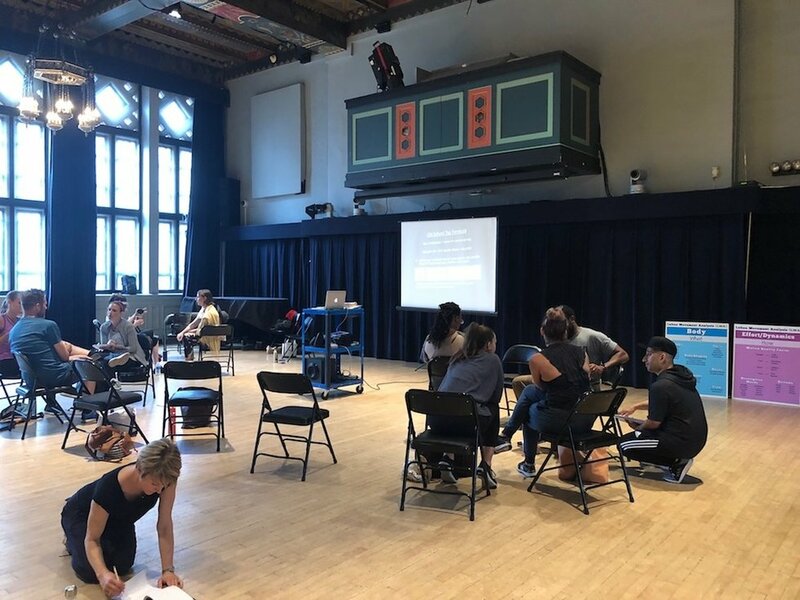 With hopes of better connecting to young students, dance educators met Saturday at New York City's 92nd Street Y for "Hip-Hop to the Top: Exploring the world through hip-hop dance." The five-hour workshop provided age-appropriate lesson plans rooted in history and Laban Movement Analysis. But the program also reassured classically trained teachers to "come as you are." After all, a "groove" is just a plié with a grounded "urban edge." Led by Elias (Eli) Kababa, who is also a teaching artist at the New York City Ballet, the workshop sparkled with positivity. Not only were mistakes welcome, they were the fuel of hip hop. Consider Grand Wizzard Theodore, who accidentally invented the record scratch technique when his mom told him to turn down his music. Kababa, dressed head to toe in black Adidas gear, asked students to introduce themselves with a rap. He used himself as an example: "Uh, yeah, we gonna make it pop. Eli, Eli, take it to the top." While a piano played in the ballet studio next door—and some educators looked like they would rather battement than battle with words—they gave it a go until the whole circle was a clapping, rhythmic "crew" of professors and classically trained dancers. Common goals of the group included dealing with behavior issues and instilling confidence among students in K–12 and beyond. Two women who teach in some of New York's most impoverished areas wanted to find common ground with their young charges, many of whom are struggling with major challenges at home. A few participants said they work in private schools and higher education, where self-esteem is also in short supply. Kababa, who teaches at several public schools, recommended guiding students toward their hip-hop super-powers. Not everyone in the class is a dancer, he suggested. Some may be DJs who control the music on their smartphones. Someone else might be the emcee who tells a story with rhymes. Another might be the artist who incorporates graffiti into set design. Several dance educators said they wanted to stay relevant at a time when Hamilton reigns supreme on Broadway. "If you want to work in New York, you have to learn hip hop," said Sue Moss, a professor at Bronx Community College. "My kids love hip hop," said Lindsey Della Serra, who teaches dance full-time at Franklin High School in Somerset, New Jersey. "But I don't feel equipped to teach it." Kababa took notes and nodded. As a first generation American, he understands that children want to be acknowledged. After relocating from Egypt to the United States, his parents felt overwhelmed by the stresses of a new country and eventually divorced. Kababa grew up in New Jersey not knowing about his Egyptian roots. Frequently in trouble, he sought refuge in martial arts. When he discovered hip hop, he and his friends would "dance until the sun went down." "I remember being 8 and 9 and riding my bike to my friend's house," he shared with the group. "We would take a mic that wasn't even plugged in, and we would rap into it and scratch up records with needles that weren't made for that. I was playing pretend hip hop at a young age. It was 1989. As I got older, hip hop naturally became my language. I think that's valuable for kids who are removed from their culture. Hip hop can give them a way in." At County College of Morris, he was a criminal justice major. But when the director of the dance department saw him breaking on campus, she invited him to check out some of her classes. 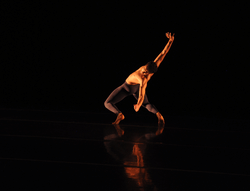 Now with a dance degree, Kababa is a beloved teaching artist at the Y and co-founder of The Garden State Dance Project. He is also a dad who knows the importance of lineage. Notable figures in early hip hop include DJ Kool Herc, who became known as the father of hip hop. Meanwhile, graffiti artists like Taki 183 and Julio 204 tagged New York subways with their spray-painted signatures. It was a way of saying, "I'm here," explained Kababa, who invited the class to draw their individual "tags" on a long strip of newsprint. Newly inspired, participants wrote a rap, "I'm More Than a Man With a Can," and experimented with sound techniques through djay Pro LE, a free app featuring two turntables. At the end of the afternoon, the group was divided into three teams that had 15 minutes to develop pieces based on all they had experienced. Participants incorporated LMA themes of body, effort, space and relationship that they could use in class. Even though they might not be as fleet as Crazy Legs, an early break-dancer, they could build a structure for kids to embellish. 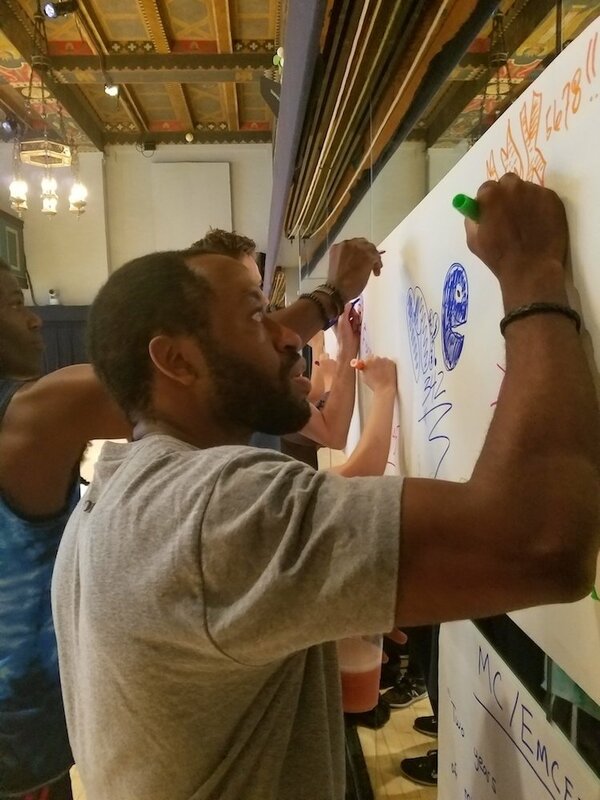 "I enjoyed hearing about the groundbreaking history," said Kelvin Cooper, a dance educator at Bronx Community College, NYU and Alvin Ailey. "I learned that hip hop is a powerful tool for expressing yourself and who you are."